West Windsor, NJ: Carol Rosenthal and her late husband Dr. Albert Rosenthal of Princeton, and David and Jo Kemble of Hillsboro, have donated four large metal sculptures to Mercer County Community College. The sculptures, by artist Richard Kemble, have been installed in four locations at the West Windsor Campus, 1200 Old Trenton Road. 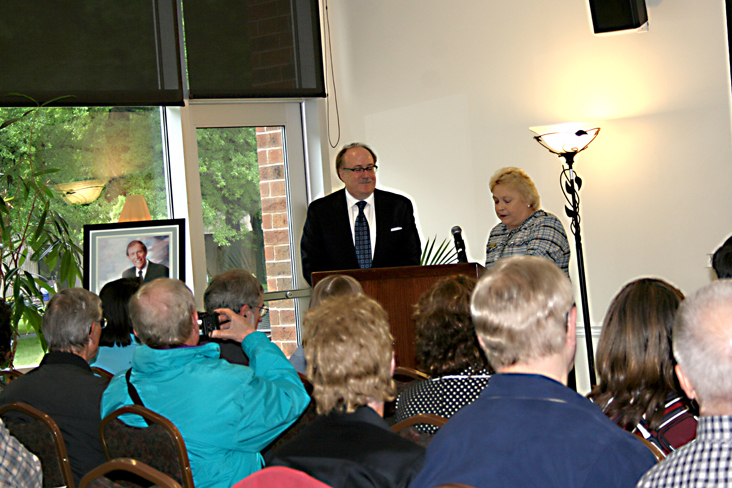 Mrs. Rosenthal and the Kembles were guests of honor during a ceremony on May 17 at the college’s Conference Center, when the sculptures were formally dedicated by MCCC Trustee Bob DiFalco and President Patricia C. Donohue. “On behalf of the trustees of Mercer County Community College, I am honored to declare the four Richard Kemble sculptures officially installed and dedicated,” DiFalco said to about 40 guests, including college faculty and staff and members of the community. 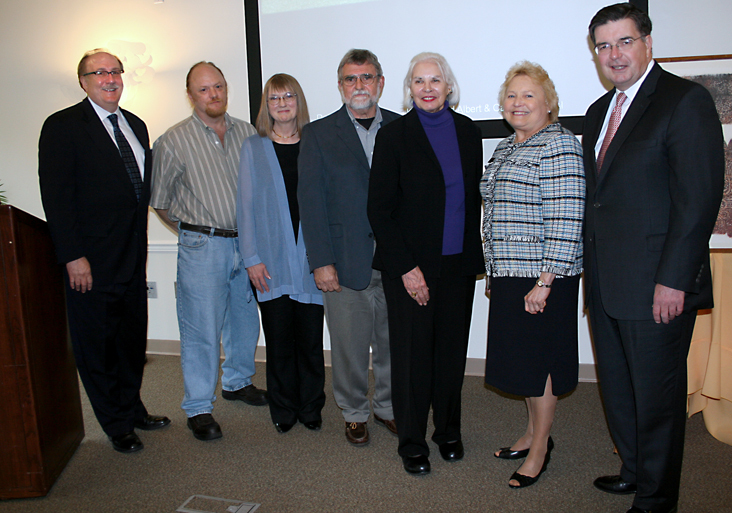 County Executive Brian Hughes thanked the donors on behalf of the county. MCCC Professor and artist Mel Leipzig led tours of the campus so visitors could view the installations. He pointed out that Picasso was the father of metal sculpture. “Picasso revolutionized the materials we use in sculpture. It used to be stone or clay or plaster,” Leipzig said. He added that the college is very grateful to the donors for their donation. “No one I know has done more for art in this region than the Rosenthals” he said. Artist Richard Kemble was a Pennsylvania native who spent nearly two decades as an art professor at the State University of New York at Buffalo and New York’s Pratt Institute. His work in printmaking, woodcuts and sculpture has made him a significant and highly respected presence in the world of modern art. Kemble passed away in 2007 at the age of 74. His artwork is in the collections of many museums including New York’s Museum of Modern Art, The Smithsonian, and the New Jersey State Museum. MCCC Trustee Robert DiFalco and President Patricia C. Donohue officially dedicate the sculptures. Participating in the sculpture dedication, from left, are trustee Robert DiFalco, MCCC Professor Michael Welliver, donors Jo Kemble, David Kemble and Carol Rosenthal, MCCC President Patricia Donohue, and County Executive Brian Hughes. 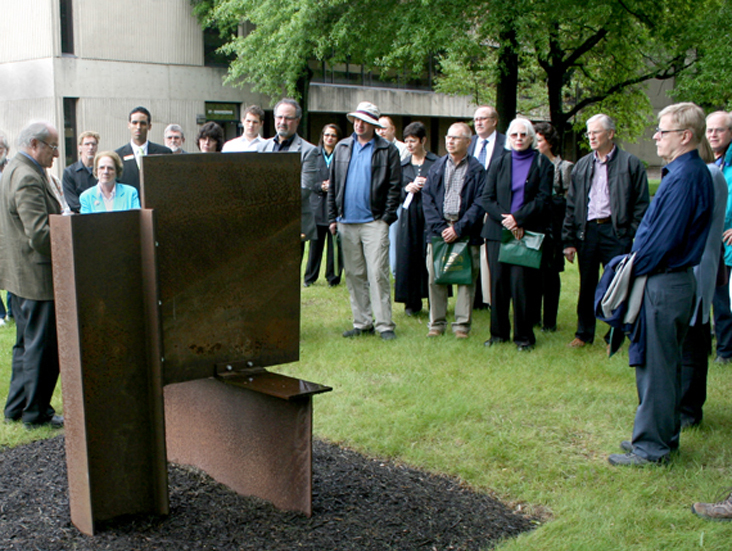 MCCC Professor Mel Leipzig, left, speaks about metal sculpture during a tour of the four installations on campus.